My heart was deeply stirred. In one sitting—on Christmas afternoon of ’98—I read an entire book in three hours. It was a book that catapulted me into a prophetic whirlwind that forever changed the landscape of my life. It was a whirlwind that took me unexpected places, opened doors for unexpected divine appointments, and uncovered exhilarating unexpected discoveries that marked me indelibly. The book was Into the Fire by Che Ahn. In the book, Ahn recounts the highs and lows of his personal spiritual journey while pioneering Harvest Rock Church in Pasadena, California. One chapter in particular stood out. That chapter gripped me. Provoked me. Inspired me—holy hunger roused within me. And it provided vision to the deep longings within my heart that I wasn’t able to fully articulate previously as a young man of 24. The chapter?—Prayer for All Nations. It wasn’t so much the information about prayer that arrested my yearning heart. It was the story of a man who prayed—and fervently so. Ahn powerfully captured the life of an intercessor-revivalist who co-pastored with him. This man had pursued God’s own heart with passion, spending much time praying and fasting for revival. Something deep within my own heart longed to become such a man of prayer—a man whose heart was fully consecrated unto the Lord. The man, a fervent intercessor-revivalist—was Lou Engle. A month later I was in Colorado Springs attending the National School of the Prophets. As is my custom, I ventured to The Arsenal bookstore to find some new treasures. Scanning the shelves, I saw a title that piqued my interest: Becoming a Prayer Warrior by Beth Alves. As I reached for it, my hand nearly collided with another hand reaching for the same book. It belonged to a man named Bill, who looked at me and chuckled. A conversation ensued, centered upon recommended books. I took the opportunity to highlight the book I read on Christmas Day. “You must get Into the Fire by Che Ahn,” I urged this man. From this divine appointment in The Arsenal bookstore, Bill and I hung out together for the remainder of the conference. The budding friendship paved the way for more unexpected opportunities. A few weeks after that encounter, I flew from Virginia to California. At that time I was a fulltime campus minister, so I was able to get away during spring break. I flew into Los Angeles on February 22 planning to stay a week. Upon my arrival in Pasadena, Bill took me over to meet Lou Engle, a man that I had only read about. It was evident in conversing with Lou—a man with a raspy voice and fire in his eyes—that he burned to see revival in this nation. He invited me to join him every morning at 5 a.m. at the Mott Auditorium to pray for revival. As we stood together in front of Lou’s house, he prayed, “Lord, activate the prophetic call upon this young man’s life!” Before rejoining his family, he ran inside to retrieve a book for me as a gift—Azusa Street by Frank Bartleman. This was an eyewitness account by an intercessor-revivalist of the Azusa Street outpouring in April of 1906 that forever changed the landscape of Christianity. At the time, I didn’t grasp the full significance of Lou Engle giving me Bartleman’s book. Fast forward to January of 2005. I lived in Fredericksburg, Virginia with my beautiful wife. Our church was to host the first Awaken the Dawn conference. This gathering aimed to bring together a convergence of multiple streams within the body of Christ to contend in prayer for an unprecedented move of God. And Lou Engle was scheduled to be one of the keynote speakers! At this time, I was experiencing a season of deeper consecration unto the Lord. In hindsight, what unleashed the transforming power of the Holy Spirit to a new level in my life was a prophetic dream in December 2004. In the dream, well-known prophetic leader Chuck Pierce and I stood together in my childhood home looking out an open window. Outside I could see clearly the lush, green leaves on the oak trees before us. Everything was so alive and fresh. Then Chuck prophesied through the open window—literally yelling at the top of his voice with much authority—before proceeding to slam the window shut when he finished. This is a year of the open window of heaven. As I have written, this is a year of the HEI of God. The Hebrew letter HEI looks like a window. When studying this word, both wind and sound blow from heaven through the window into the earth realm to bring change. Declare that you are willing to change and watch your atmosphere begin to be filled with God’s presence. God does not produce signs and wonders from heaven as ends in themselves. They are released to bring faith to His people and those around them— whether believers or unbelievers. My dream signified an opening of the window of heaven in my life. In the ensuing weeks I had other prophetic dreams, increased passion for Christ, greater victory over sin, and powerful visitations of the Holy Spirit—thus, confirming that a window of heaven was indeed over my life. My heart hungered for a greater revelation of Christ as I cried out daily to the Lord for grace to consecrate my heart afresh to Him. As the date for the Awaken the Dawn conference loomed closer, I asked the Lord to give me wisdom regarding what book to purchase for Lou Engle as a gift of appreciation, since he gave me the Frank Bartleman book when I first met him. Over the years I read Lou’s books Digging the Wells of Revival, Fast Forward, and The Elijah Revolution; plus I consumed countless audio messages by Lou. His ministry had greatly influenced my life. I felt compelled by the Lord to pray for the right book to give him. The Lord answered my prayer through a dream on January 21. In the dream I told Lou that I’d been praying about getting a book for him called Lost Causes by George Grant. Yet, he was fascinated with another book in the bookstore titled America, Founded on Faith, Built on Character: Defining Moments in America. Upon awakening, I knew that this dream was indeed from the Lord. I purchased the book. When Lou arrived at the conference, I immediately presented him with my gift. As you can imagine, Lou was elated due to the subtitle: Defining Moments in America. Defining moments had been a prophetic theme in his life during that season! The night prior to Lou’s scheduled speaking engagement at Awaken the Dawn, I took the time to write out the dream about the book. I explained how we met previously in 1999 through a mutual friend. When I finished, I placed the letter inside the book. At that moment, a strong tangible awareness of the Lord’s presence permeated the room. I had an overwhelming sense that the Lord desired to speak to me at that very moment. As I waited with anticipation upon the Lord, I noticed a book nearby I had not read: History Makers, coauthored by Dutch Sheets and William Ford. Suddenly—quietly but urgently—the Lord impressed upon my heart to read page 143. As I turned to page 143, my eyes were drawn to a section called The Generations Reconnected, which started with a quote from Lou Engle. The Lord had my full attention! Expectant faith surged in my heart. I had finished the letter to Lou just a few minutes beforehand; now I sensed God was about to speak to me something dear to His heart. Strategies alone will never bring revival because revival is the eruption of God’s heart on a life poured out. It’s the Father’s response to those who have been His lovers and to whom He gave promises and sent fire on their offerings. These faithful ones passed into glory and their eternal reward. There then arises another generation, a generation of great grandsons and great granddaughters ‘….who knew neither the Lord nor what He had done for Israel [His people]’ (Judges 2:10). One day one of these granddaughters finds a book among the heirlooms and prized possessions of her grandmother stored in the attic. The book is her grandmother’s diary, the stories of a woman who prayed hours…until the Holy Spirit came and shook her church and the surrounding township. As the young reads, she begins to burn inside, saying, ‘This is my heritage. Wow!’…That young girl pours herself out to God, and another memorial is made. At the time of his discovery, Lou had just moved to Pasadena, where Bartleman also had lived. Though Lou is not related to him, he felt a connection with this man of faith and cried out for his mantle. 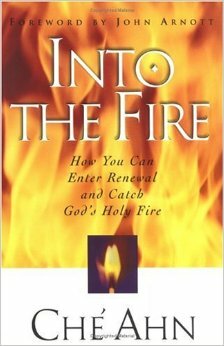 Lou said he cried out to God for hours one day after reading this book, praying, “Lord, give me the mantle for prayer Frank Bartleman had! I want what he had!” This intense intercession went on for about two hours. Unaware of this, a friend of Lou’s came to him the next day and said, “Lou, I had a dream about you last night. In the dream, I was handed a black book with ‘Revival’ written in gold letters across the front. I opened it up and saw a picture of a man named Frank Bartleman, with his name underneath the picture. As I was looking at the picture, all of a sudden his face changed to yours, Lou!” His friend had no idea that just the day before Lou had been crying out for Bartleman’s mantle for revival. What an amazing story! This intercessor-revivalist was used mightily in the Azusa Street Revival. My heart was deeply stirred. I paused to ponder the question: Did the Lord desire to lead me in the direction of pursuing a mantle, just as He led Lou Engle to cry out fervently for the mantle of Frank Bartleman? This whole process started because of my desire to give Lou a book in response to the Bartleman book that he sowed into my life. Now I was reading about the impact Frank Bartleman had on the life of Lou Engle. This wasn’t just a mere coincidence. I knew that this was indeed of the Lord, yet I was uncertain as to how to proceed. I was cautious. So, I simply prayed that the Lord would make His purpose and plans in this matter absolutely clear, because I was well aware that my motives could be driven by selfish ambition. During this season in my life I had also discovered that the area where my wife and I had settled (Spotsylvania County) in 2003 had actually been the roots of my Christian lineage. I never knew this. Previously I thought I had always been the first one saved in my family with the exception of my mom’s grandmother (and her sister) who was a God-fearing woman. I found out that this grandmother came from a godly lineage originating in Spotsylvania County. Excitement percolated within my heart because previously I was only aware of destruction in my lineage. Both my biological father and his father committed suicide. My mom’s parents abused drugs and alcohol and were both dead by the time they were 42. Literally I could feel the weight of these generational iniquities. In light of this new insight concerning a godly heritage, I contacted a relative on February 1, 2005 who was well versed in the family tree. As I conversed with her over the phone, she confirmed what my mom told me concerning the godly heritage. Then she shared something that dramatically altered the course of my life. My forefathers were godly people associated with the early circuit riders. This was new information for me. Needless to say, I was a captive audience! Excitedly I gushed, “Asbury is my favorite Methodist circuit rider, along with John Wesley!” I was stunned. I couldn’t believe that my forefathers were good friends with Asbury and that he would stay with them when necessary. Yet, there was one more thing that would take this new revelation to a whole new dimension. 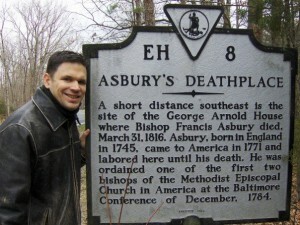 This is what impacted me the most: Francis Asbury died in the home of my ancestors. As he travelled from Richmond, Virginia to Baltimore, Maryland, he stopped with his companion to stay at the home of George Arnold. Then on March 31, 1816, he passed from this life into eternity to be with the Lord Jesus Christ. So exactly what does this mean? To the best of my understanding, I would sum it up in the following: The mantle of Francis Asbury came to rest in the house of my forefathers. And I believe the Lord sovereignly invited me to pursue this mantle. 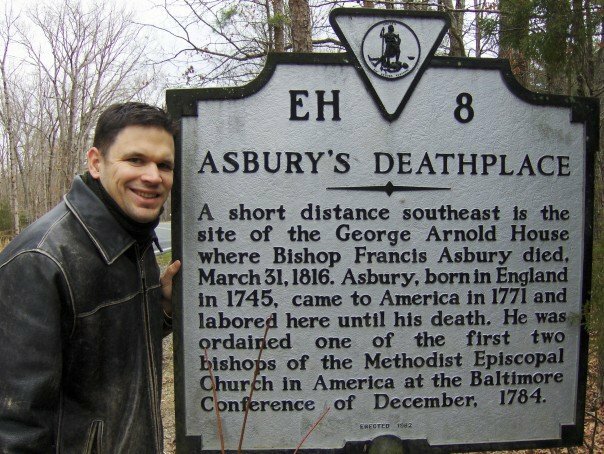 Francis Asbury was sent to the colonies by John Wesley and became the pivotal leader of this fledging movement. Yet after 45 years, 250,000 miles on horseback, 16,000 sermons, this “Father of American Methodism” left a mantle of great worth—a changed nation. Words cannot adequately capture the significance of this discovery and the corresponding impact that it had on my own life. I haven’t been the same since this window of heaven was opened in my life. Although I had known the Lord for over twelve years to that point in 2005, I was ignorant concerning my godly lineage and their association with Francis Asbury. 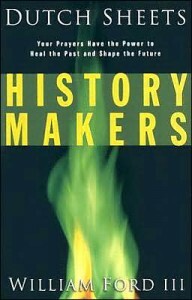 The Lord graciously opened a window of heaven over my life during that season as I learned of this revelation four days after initially reading about Lou Engle in the History Makers book. The rest of this story will be shared in a book in the near future. Please sign up on our main page for our mailing list to learn more about this.